2) One additional item that holds great personal value to you. 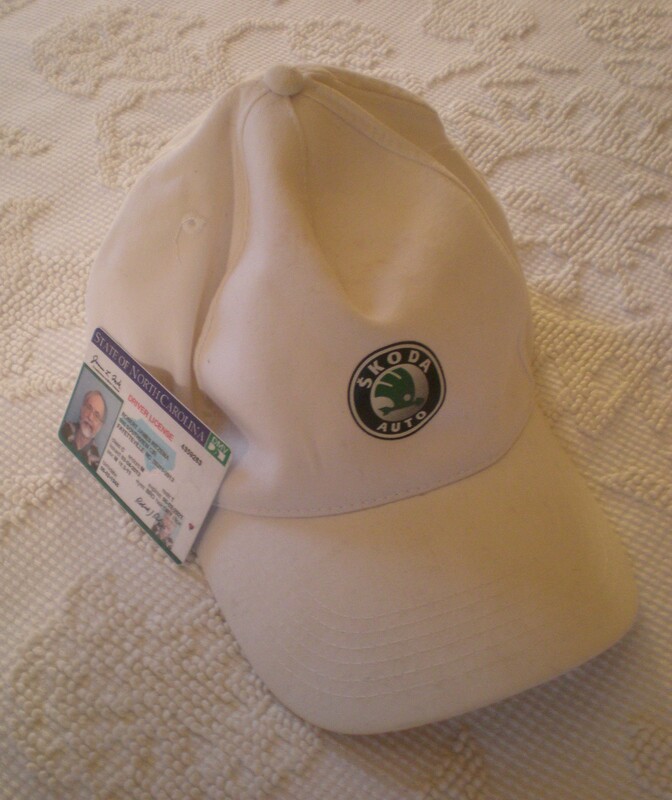 Finding an item that I enjoy wearing was easy: among the many choices available, I chose my Skoda Auto cap since it reminds me of a trip to the Czech Republic, of my son Elliot (whom I visited there and from whom I got the cap), and of jogging, which I do while wearing the cap. The “item that holds great personal value” was more difficult. What of my possessions do I particularly value? I considered bringing something that represented my past achievements, such as a diploma or one of the articles I had published. I decided that what I value with each of those is the achievement itself, not the object that represents it. My diplomas have lost their functional value of establishing my credentials since I don’t expect to apply for anything for which I would have to document my education. Should I lose one of my diplomas, I would look for it but wouldn’t be particularly concerned about no longer having it. I remember what I accomplished, and that’s enough. I also considered bringing an object that reminded me of one or more people who are important to me. More than half of the twenty or so people who attended the retreat took this route. Several brought rings given them by a parent or grandparent, at least one brought his wedding ring, two brought pictures drawn by a young son or daughter, one brought a family photo, and someone brought a necklace that her grandmother had purchased shortly after immigrating to Canada from Europe. I almost brought my dad’s wedding ring, since that reminds me not only of my dad but of what mattered to him. Losing it would bother me much more than would the loss of a diploma. Still, I wondered: is it really the ring that had great personal value to me? Maybe what’s important isn’t so much the ring itself as the memories it evokes and the person it represents. I ended up bringing something that seems at first less personal but has features that the diploma and ring do, and more: it not only evokes memories and represents something important, but also is crucial to my life on a daily basis. I brought my driver’s license. My driver’s license evokes memories. It makes me think of myself at age 16 learning to drive. The local school system had paved a small private grid of roads on which we trainees could practice without having to encounter regular traffic. After a few weeks we ventured out on the nearby streets, each of us accompanied by an instructor. I eventually practiced with my dad and, after a couple months, went to get my license. The road test was nerve-wracking! I was so proud to pass! My first license represented both a significant step towards adulthood and the ability to go places on my own that I could never have reached on foot, by bicycle, or by bus. That ability to go places was more freedom than I had ever known. Having a driver’s license still represents both being an adult in my society (in the U.S., the great majority of adults have licenses) and the freedom to go places without having to worry about bus, train, or plane routes and schedules. I don’t know how many cars I’ve owned in the past 61 years (15 that I can remember) or how many miles I’ve driven (over half a million for sure). Regardless of the exact numbers, I remember hundreds of roads I’ve taken and places I’ve visited. It may seem that a driver’s license is impersonal, since it is a piece of plastic very much like the pieces of plastic that millions of others carry. But the memories of where I’ve driven are uniquely mine: I didn’t boldly go where no man had gone before, but I went certain places but not others via the routes and at the times I chose. Besides, my card is unique to me in one sense; it has my picture on it. Besides the memories my license evokes and the status in my society it represents, my driver’s license has value to me in another sense: it is necessary for my daily functioning. I know of several adults older than me and a few younger than me who have had to surrender their driver’s licenses because of medical problems that prevent them from driving safely. In each case, the loss of driving privileges changed the person’s life dramatically. It usually produced a sense of loss leading to feelings of grief. Some were quite bothered having to depend on others for transportation. As I’ve run across more and more people who can no longer drive I’ve become increasingly grateful that I am still a licensed driver. I hope to remain that way for lots of years yet. Does my driver’s license hold great personal value for me? Yes, I treasure it. I would not have thought of a driver’s license, but it makes perfect sense.